Provide comfort for the family of Luis Luna with a meaningful gesture of sympathy. Luis J. Luna, age 85, a resident of Casa Colorada, passed away on, Sunday, March 24, 2019. He served proudly as a Staff Sgt. in the National Guard, and Sgt First Class in the U.S. Army. Luis was a graduate of New Mexico State University for agricultural education. He then taught high school math and agricultural studies for 6 years and was voted teacher of the year in 1963. Luis also was a weights and measures inspector with USDA in Las Cruces, NM, as well as a substitute inspector for 10 years. His favorite memories were with his uncle who raised him. Some of his hobbies were gardening, politics, hunting, fishing and listening to Willie Nelson. He is preceded in death by his parents; Francisquita Romero Tapia and Damacio Pino Luna; and son, Mark Luna. Luis is survived by his loving wife, Martha; children, Jessica, Angelica, Denise, Cindy, Laura, and Jason; sister, Leocadia; grandchildren, Alexandra, Mark, Liliana, Maya, and Julian; and great-grandson, Gunner. A Public Viewing will be held at 5:00 p.m., on Wednesday, March 27, 2019, at Noblin Funeral Service Belen Chapel, with a Rosary to be recited at 6:00 p.m. A Final Viewing will be held at 9:00 a.m., on Thursday, March 28, 2019, at Our Lady of Belen Catholic Church, with a Funeral Mass to be celebrated at 10:00 a.m. Interment will take place on Friday, March 29, 2019, at Santa Fe National Cemetery at 9:00 a.m.
Pallbearers will be Jessica Luna, Angelica Barela, Julian Luna, Mark Luna, Jim Malkoski, Fidel Luna, Marcel Pecastaing. Arrangements are being handled by the caring professionals at the Noblin Funeral Service Belen Chapel, 418 W. Reinken Ave., (505)864-4448. To send flowers in memory of Luis J. Luna, please visit our Heartfelt Sympathies Store. Kris & Tom Malkoski and family sent flowers to the family of Luis J. Luna. Denise, Jim and the Luna family-We hope wonderful memories guide you through this difficult time. 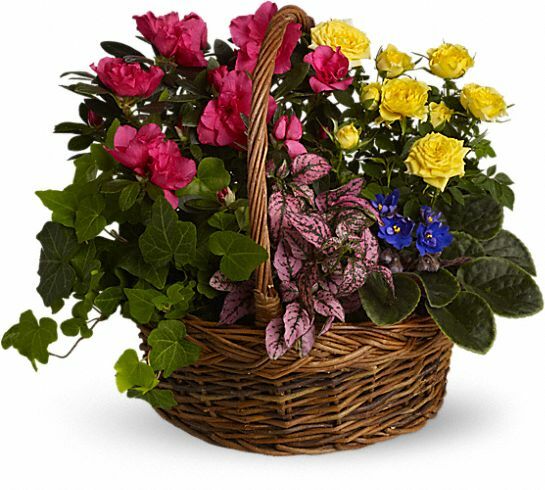 Kris & Tom Malkoski and family purchased the Blooming Garden Basket for the family of Luis Luna.